entitled " Debunking a myth about museums that pay for themselves." 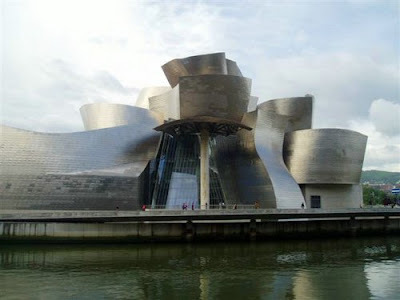 Mr. Filler raises several excellent points, but one main takeaway for me was that museum boards, in their quest for the next "Bilbao" often times sacrifice important, if not essential, aspects of buildings like on-site storage. Creating a new museum building clearly shows the values that the institution's stakeholders hold dear. Does form truly follow function, or do the design stylings of a "starchitect" reign supreme? Does your new museum serve as a gateway to your community, or a playground for the elites? Unfortunately, monumental architecture does not have a great track record for engendering ongoing community support. Mr. Filler highlights recent projects in Toronto, Milwaukee, and Denver that failed to live up to the promise of creating "economic engines" for their respective regions. An unfortunate corollary to this "edifice complex" in the museum community is the notion of architects serving as both building designers and exhibit designers for new projects. This is generally a bad idea, especially when it comes to museums with high numbers of interactive exhibits. You wouldn't hire an exhibit developer to design a new building (would you?) So why do some museums hire architects to design interactive experiences? Instead of a blending of architecture and experience design, most museums with architect-designed exhibits seem like the interactive equivalent of "LegoLand" with mini-buildings or "design statements" inside a larger shell. Of course, the economic realities of starting up and maintaining a museum have always been with us. But in the end, true passion, not ego, not finances, is what drives excellent institutions. To paraphrase Mr. Filler, "Do what you love...if you make a profit, good for you. If not, good for you, too, because you’ll have been enriched by living with a thing of beauty." One of the most impressive components of the Agents of Change initiative at the Ontario Science Center was their ability to raise millions for a project that did NOT involve constructing a new building. It's great when we can convince boards that there are exciting things to support inside the walls, not just the walls themselves. Thanks for the link! Your mention of OSC's Agents of Change project presents a great challenge for every museum with a traveling/temporary exhibit space: what kinds of experiences can you create using internal and community resources for the same amount of funds you would use to bring in a traveling show? How would doing such a thing change both internal (staff) and external (community) attitudes toward the museum?